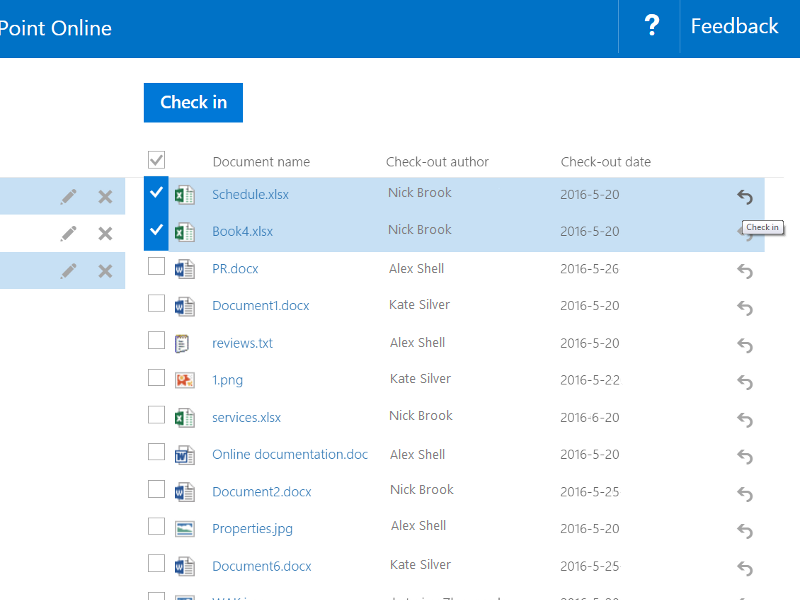 Checkout Manager for SharePoint Online is an easy tool to get access to all checked out documents in your SharePoint libraries. 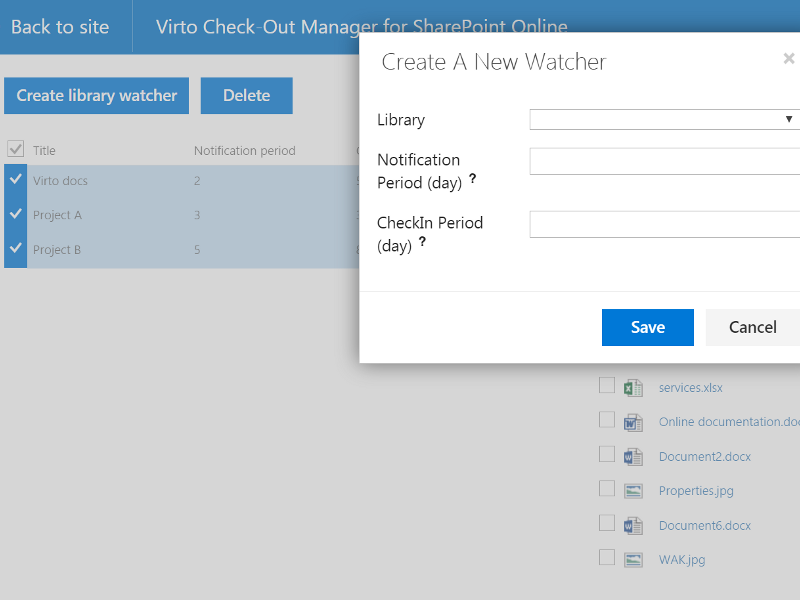 Using Virto Checkout Manager, you can ensure with reminders and auto check in feature that all checked out files in your SharePoint environment are not forgotten about. The common problem of SharePoint file sharing is documents left checked out. When multiple employees must work on the same documents, they often forget to check in them and block coworkers from editing this content. 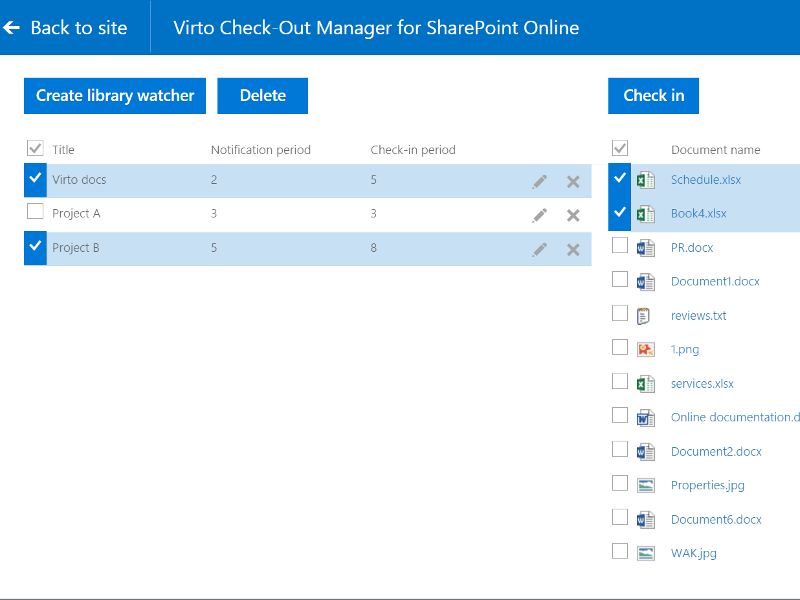 With Virto Checkout Manager for SharePoint Online, you will have no checked out and forgotten documents in your SharePoint environment! Your team can use any collaborative documents, without the need to remember about all checked out files. Reminders, auto check in feature, and the ability to view all checked out documents in a single place will increase your team productivity and allow you to focus on what truly matters! The Office 365 Checkout Manager is a part of Virto ONE Cloud. Sometimes, SharePoint users just leave their checked-out documents and forget about them. Now, you can view and manage all checked out files in one place, without having to log in as the user who checked out each of these files. Virto Checkout Manager gives you access to all blocked checked out documents in each SharePoint library, so you can check in all thess files in bulk or check in the required files only. Virto Checkout Manager provides the ability to set a notification period to check in your files. For example, after two days, you will receive an email notification with a reminder to check in your document. You will never forget to change check out documents, and your coworkers will have access to shared files just in time! Do not worry about situations when a document will remain locked until you release it. With Checkout Manager, you can assign an auto check in period for each library. Now, all your check out documents will be available for all users after a designated time. Virto Checkout Manager for SharePoint Online prevents conflicts in SharePoint environment, where multiple users might want to edit checked out content or need to check in their files after receiving a reminder or automatically.